Reach your target audience with Voodoo SMS. Our web SMS gateway lets you send marketing text messages, offers, alerts and SMS notifications to your customers and target audience at a highly competitive price. Our web based SMS gateway is designed to operate entirely within your browser, making it as easy as possible for your business to deliver mass SMS without any special software. In just a few minutes, you can build and launch your highly successful SMS campaign. With our powerful web-based SMS API, you can even integrate Voodoo SMS with your mobile application or desktop software to deliver automated SMS alerts and notifications to customers, users and CRM prospects. Thousands of UK-based businesses rely on our powerful SMS gateway. Voodoo SMS works by delivering bulk or individual SMS messages from a web-based interface. This means that there is no need for you to download and install any software or purchase any mobile equipment. Your text messages are delivered from our web SMS gateway via our short code number. If you have an existing UK long phone number, you can customise your SMS campaign to deliver from your phone number. We support dynamic SMS, which means that you can personalise your messages with names, phone numbers and other custom variables. You can even send a special coupon code as part of each message to increase your campaign's response rate and generate leads and sales. Using our web to SMS gateway is simple. After you've created your free account, all you need to do is import your target audience. Writing your first marketing or notification text message is simple with our user friendly web-based platform. Using Voodoo SMS, you can send your text message to your entire list as an instant broadcast, or schedule it for delivery at a later date. You can also schedule your message to send in small batches to give your sales and customer service team a continuous stream of leads. Since Voodoo SMS runs entirely within your web browser, your SMS campaign is stored on our secure servers. This means that you can access and modify your campaign from your desktop PC, notebook, smartphone or any other supported device. There is no minimum cost to use our web SMS service. You can fund your account for a single message or purchase more than one million SMS credits at once to take advantage of our bulk pricing. Our volume-based pricing means you pay less for each text message the more you send. SMS credits start from just 1.74p per message, allowing your business to reach a large audience at a small fraction of the cost of other marketing channels. Trusted by thousands of SMS marketers, app developers and leading businesses, Voodoo SMS is one of the UK's most powerful and affordable online SMS gateways. Create your free account now to start delivering targeted, effective text messages via Voodoo SMS. 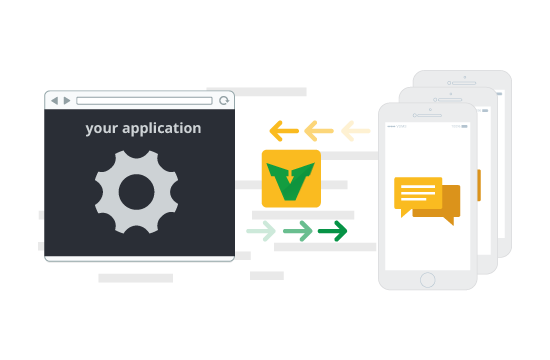 Our powerful SMS API makes it easy to integrate Voodoo SMS with your application to deliver SMS automatically. The Voodoo SMS API uses a REST interface and is designed to integrate with mobile apps, web applications, desktop software, e-commerce platforms and more.